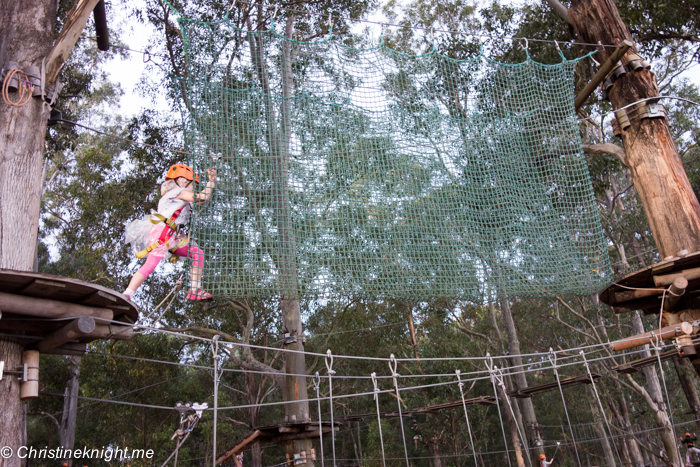 TreeTop Adventure Park Western Sydney - Adventure, baby! 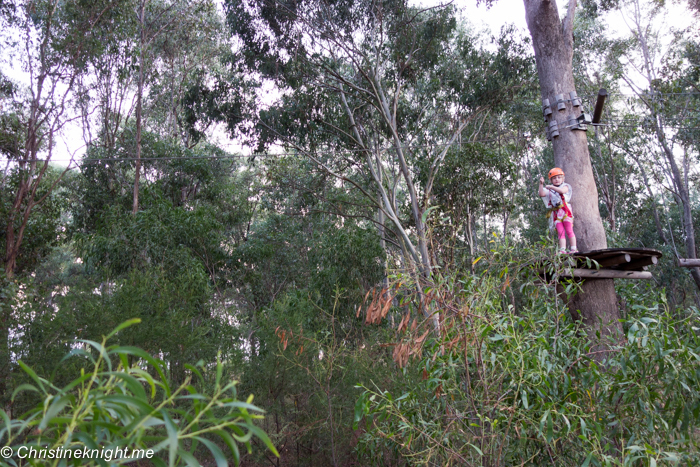 Do you have a kid who loves climbing, heights and physical challenges? 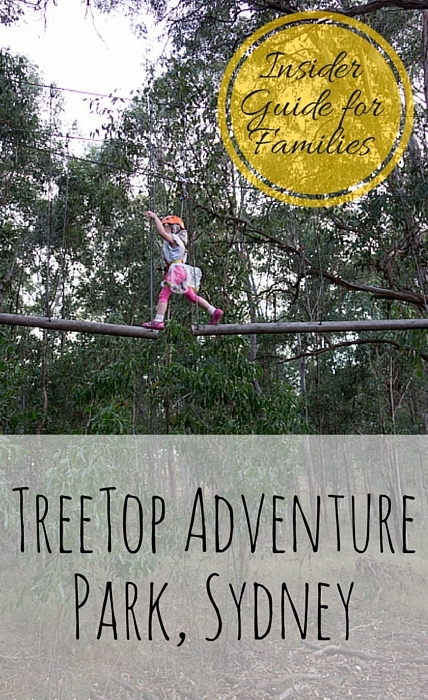 Then TreeTop Adventure Park is a must-do for your family. 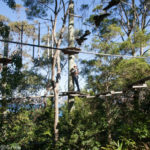 TreeTop Adventure Park operates three parks, in Wyong, Newcastle and Sydney – we visited the Sydney one which is located inside the Plough & Harrow Park in South-West Sydney. 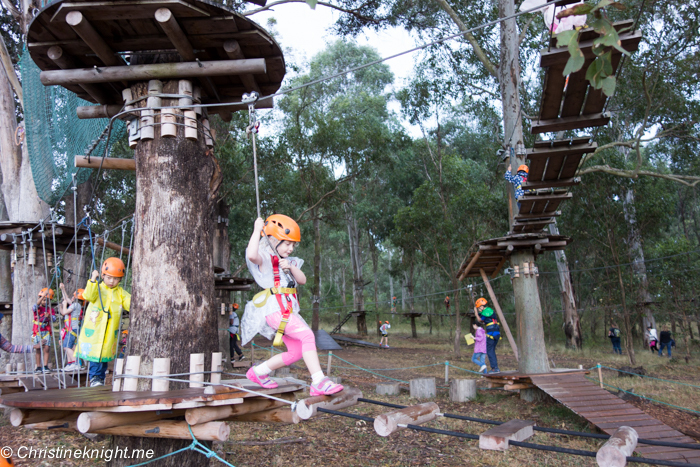 TreeTop Adventure Park has courses for kids and adults, with the children’s course suitable for little ones aged 3 – 9. The next group, “Juniors”, consists of three courses for kids aged 10 – 17 who are at least 1.4m tall. 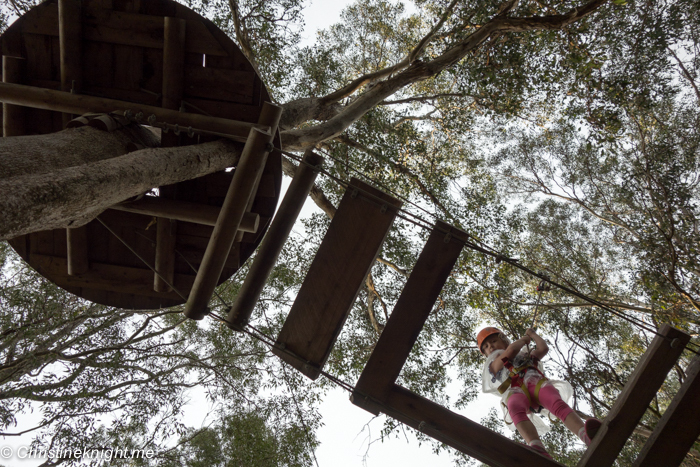 The children’s course is made up of four courses with different degrees of difficulty, and four flying foxes. While booking isn’t mandatory, the sessions are so popular that I highly advise booking a few days in advance to ensure you can take part in the timed session of your choice on the day. One the website TreeTop advises you arrive half an hour before your timed session, and if the weather is nice you may as well arrive early to make a day of it. 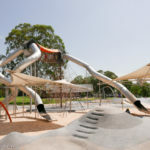 The Adventure Park is right next to a massive playground in Plough & Harrow Park so kids can play there until they need to put on their helmets and harnesses. We were incredibly unlucky with the weather on our day. The skies opened and it poured just when we arrived. The session before ours climbed in the rain, but thankfully it eased up when our session was beginning to a slight drizzle. 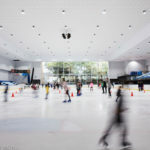 The sessions go ahead unless there is lightning or heavy winds, in which case the courses are suspended until they can begin again. I advise bringing a rain coat if there is a chance of rain, or investing in a $2 rain poncho from TreeTop like we did on the day. Each group is restricted with numbers for safety reasons. 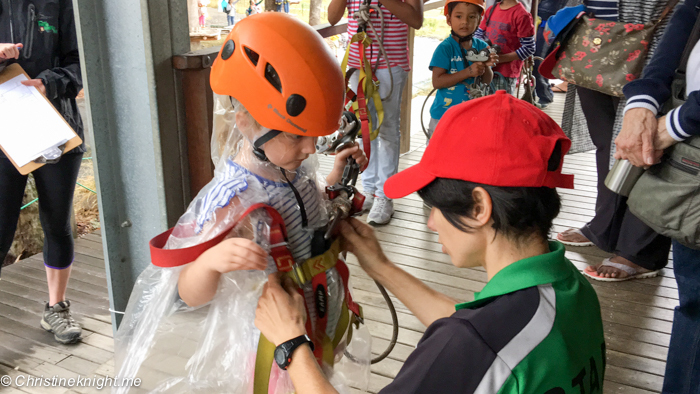 The kids are strapped into the harnesses and helmets by TreeTop staff, and then given a very detailed talk on safety. 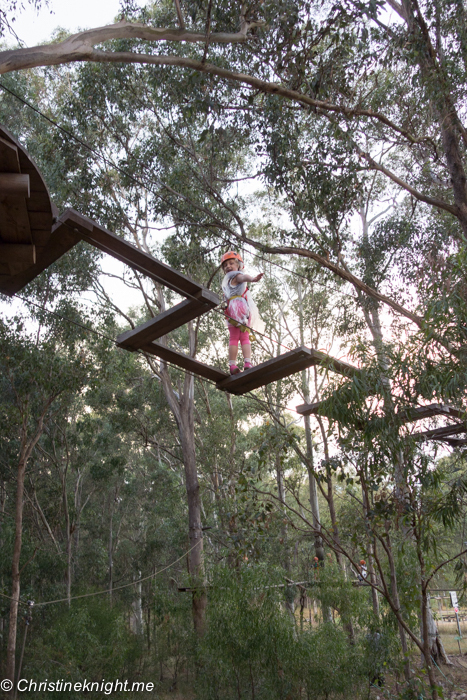 The instructors drill the kids on the number of kids allowed on each platform, challenge and flying fox at a time, and ask the kids repeatedly to make sure the kids understand all the information. 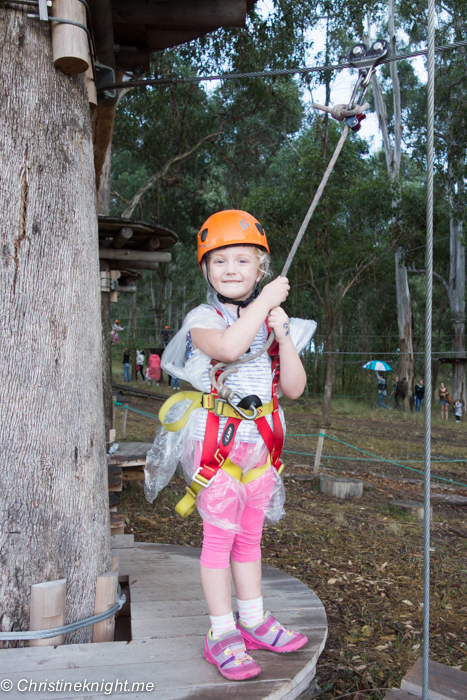 Each child’s harness has it’s own metal pulley that is used to hook onto the wire that runs above each course for safety. They are large and heavy, making them quite dangerous for little kids to be trusted with, but the instructors had an excellent way of teaching the kids about how to use the pulleys, calling them a “froggy”, and using terms that kids would understand – like the “froggy” had to be put onto the wire “frog to the log” so he could “eat his food” (AKA the wire). The rope dangling down was called the “tail”, so we were calling out repeatedly “hold onto the tail!” and so on to describe how to get across the challenges. The first course, “white”, was the easiest, and designed low to the ground so parents could hold their child’s hand if needs be. 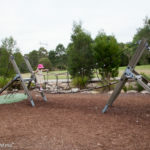 It also allows parents to assist kids with getting the pulley over the connectors at each platform – this, for the little kids, proved to be the hardest element of the courses. It was really difficult to swing the rope hard enough to get enough momentum to push it over the edge of the connectors at each platform. Once the kids are up on the higher courses, they must to every element on their own, as adults are on the ground and can’t reach to help. 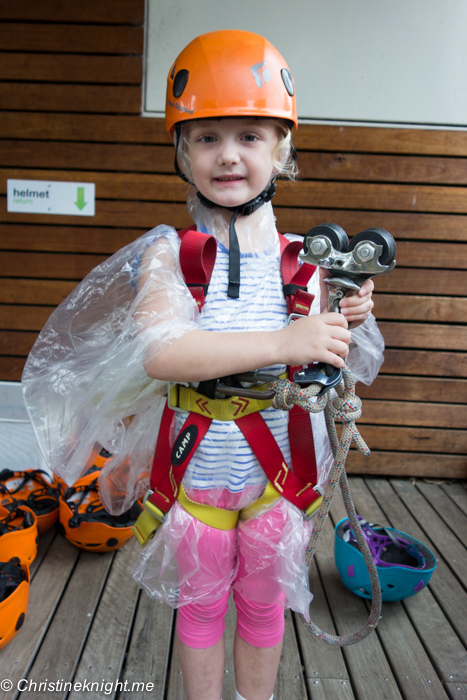 For my four-year-old, the courses were exceptional for not just physical enjoyment, but also to help her self-confidence and resilience. 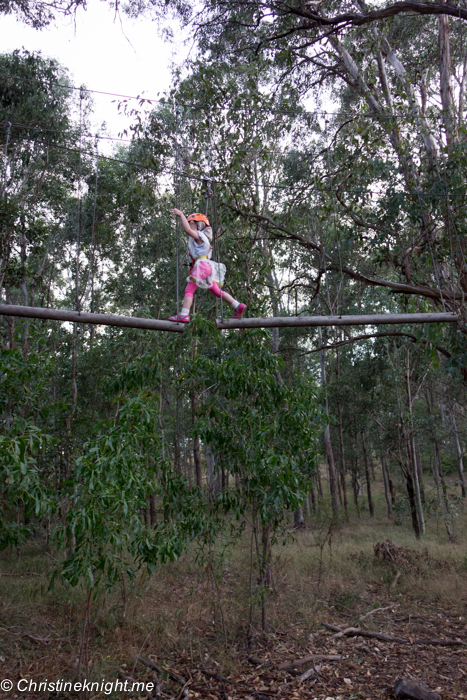 Quite a few times she struggled to get her pulley over connectors, but had to work it out herself – and while she got frustrated, she managed to do it, every time. 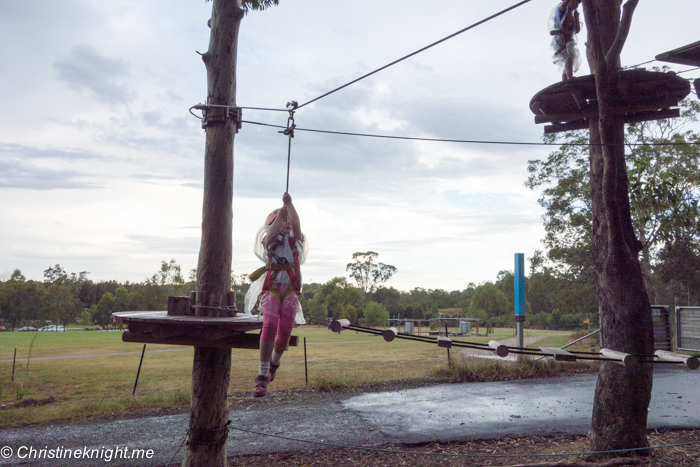 She also lost a shoe at one stage, while she was several metres over our heads. 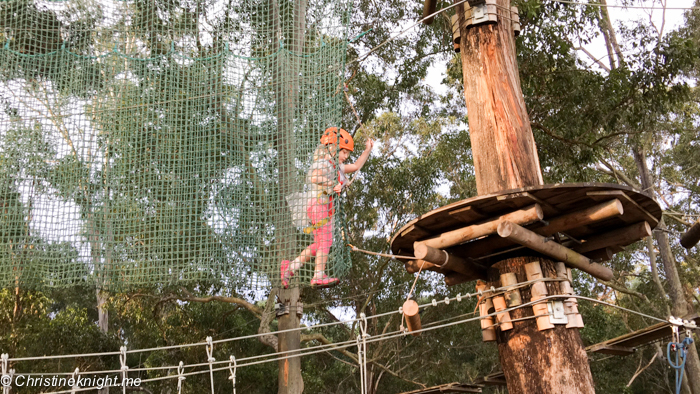 Even though she couldn’t reach her feet with her hands, and she was balancing high up on a tiny platform, she managed to use her foot to place the shoe in the right position and jam her toes inside so it was on well-enough to get to the next platform where an instructor could fasten it for her. 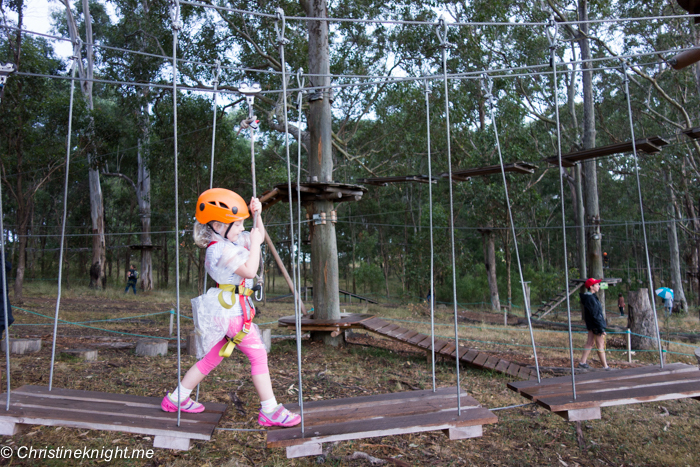 As an only child, Cheese is used to us doing a lot of things for her that she could probably work out herself, so this ropes course was just what she needed to realise that she was more than able to conquer many difficult things on her own. As the courses got harder, they involved more problem solving skills as well as balance, agility and also confidence! 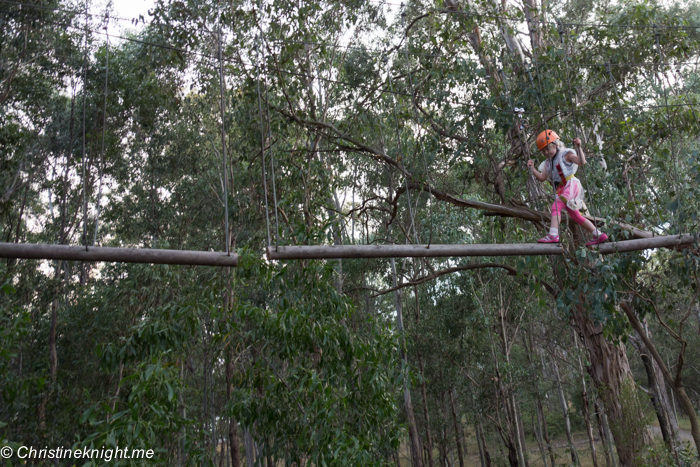 The last two courses involved a lot of moving logs and sections that were quite far apart – pretty hard and scary for little kids whose arms and legs couldn’t reach them. I was so incredibly proud of how Cheese conquered all of the four courses. 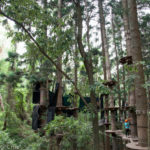 The minimum age for participation is three, with no height minimum, and, while there were three year olds on the course, there were a few who attempted the harder courses, got stuck or scared, and then couldn’t get down. The way the courses are created, you hook on at the start and unhook at the end. There is no way to unhook in the middle – AKA there’s no going back if you get scared or can’t physically finish the course. 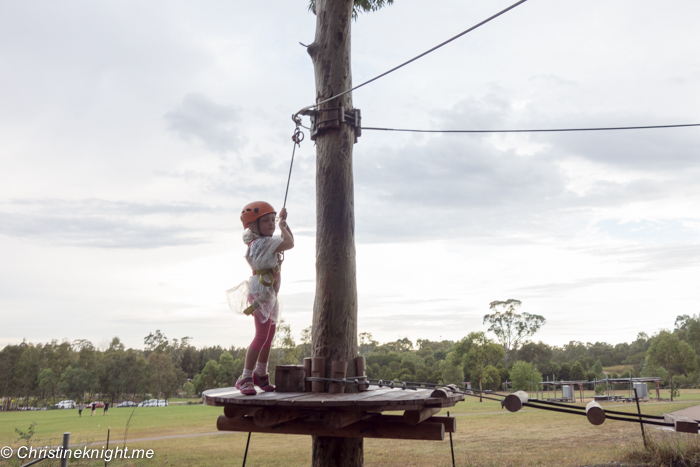 We had a moment during one of our courses where the kids all had to reverse backwards through the course to the beginning and unhook to allow a smaller child to leave the course. On the website it’s advised that you buy or bring gloves, and while we didn’t this time, we will definitely buy a pair when we return. 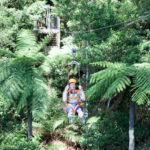 Shoes must be closed toe like sneakers, and I would suggest long tights for girls so their legs don’t rub on the harness. 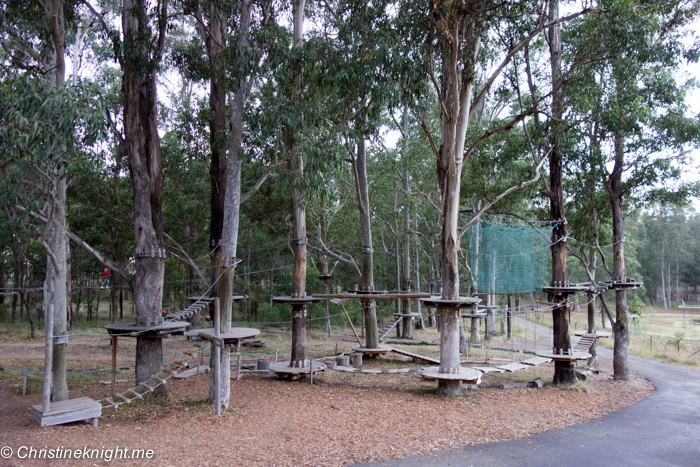 Looking around the courses I was pleased to see that they were set up in a way so as to not harm the trees – there was no drilling used to attach the platforms, and the structures were designed to allow trees to grow free of restrictions. The children’s course costs $28 per child. While initially I thought it sounded pricey, the you have two hours to spend on the courses. Time absolutely flies by and I really thought that it was money well spent. Cheese finished the day feeling strong, brave and incredibly happy! She told us she had the best day ever and can’t wait to go back.